This article is about the game. For the book of the same name, see Wario Land 4 (book). 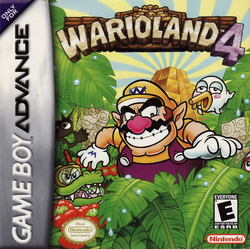 Wario Land 4, known in Japan as Wario Land Advance: Yōki no Otakara (ワリオランドアドバンス ヨーキのお宝, meaning Wario Land Advance: The Treasure of the Golden Diva), is a platform game released for the Game Boy Advance in 2001. It was later re-released for the Nintendo 3DS system on December 16, 2011 via the Nintendo 3DS Ambassadors program, just after its ten year anniversary as well as the downloadable Virtual Console game for the Wii U on May 8, 2014. It is the fifth game overall in the Wario Land series, which is a spin-off of the Super Mario series. It is also the final Wario Land game to be released on a handheld system and the last Wario Land game for seven years until Wario Land: Shake It!. In the game, Wario travels to the Golden Pyramid after reading a newspaper article about a rumor of a Legendary Treasure hidden inside. His intention is to rob the Pyramid, but he accidentally goes on a quest to save the legendary Princess Shokora from the money-crazed Golden Diva, evil ruler of the Golden Pyramid. The game features 2-D graphics with linear transformations (similar to Super Mario World and Super Mario World 2: Yoshi's Island). Wario Land 4 has received very positive reviews from websites and game critics alike, enjoying praise for its soundtrack, collectibles throughout the game, and level design. 17.1 WarioWare, Inc.: Mega Party Game$! The newspaper article shown in the game's intro, with the Black Cat's shadow. The Black Cat almost getting run over in the game's intro. Does Wario smell treasure again? Oh yes he does! Whilst reading his morning paper and picking his nose, he reads about the legendary Pyramid of Shokora! With no delay, and even forgetting to take his mid-morning nap, Wario hops into his fantastic car and heads off to find the Golden Pyramid. Sometime before the events of the game, the legendary Golden Pyramid was discovered deep within a jungle. Expeditions were mounted to find the Pyramid's treasure, but a series of accidents prevented anything from being found. The game's story properly begins one morning with Wario reading the newspaper in his house. He reads an article about the Golden Pyramid and all the treasure within, and decides to go steal it for himself. He then hops in his car and heads towards the pyramid, almost running over a Black Cat on the road. Wario falling down a precipice within the Pyramid. Upon arriving at the Pyramid, Wario climbs the outer stairs and heads inside, where he finds the same Black Cat that he almost ran over earlier. The Cat leads Wario deeper into the Pyramid and down a hole. Wario lands in a room near the center of the Pyramid, and proceeds to complete the challenges of its five Passages, thus opening the way to the Inner Pyramid, where the evil ruler of the Golden Pyramid, the Golden Diva, resides. After exploring the Golden Passage inside the Inner Pyramid, Wario comes face to face with the Golden Diva. The Black Cat then jumps in front of Wario and attacks the Golden Diva, to no effect. The Cat gets swallowed by the Diva, who proceeds to fight Wario. After the Golden Diva's defeat, the Pyramid begins to crumble. Grabbing his treasure, and with the Black Cat in tow, Wario hurries to escape the Pyramid. They both make it out, and watch the Pyramid crumble to the ground from a distance. The Golden Diva's jewelry then flies out of the treasure sack and toward the Black Cat. This causes the Cat to change form into Princess Shokora, the ancient ruler of the Golden Pyramid who was cursed by the Golden Diva. With the Diva's defeat, the curse is broken, and the princess thanks Wario by kissing him on the cheek. She is taken away by angels, and Wario takes his treasure to his car and heads home. The black cat transforms into Princess Shokora in front of Wario. The ending cutscene shows Wario speeding through the city, almost running over a cat once more. A newspaper flies into the cat's face, with an article that reads: "STEAKS! EAT AS MUCH AS YOU CAN!!". The game ends with gold bars forming the words THE END. A map of the Golden Pyramid. Click on an area to open that relevant article. Four Pyramid Jewels need to be collected in each main Passage. Upon creating a new save file, the player can select a game mode to play. There are Normal, Hard, and S-Hard options. The most difficult mode, S-Hard, is unlocked upon completing Hard mode. Gameplay begins in the Entry Passage which includes one level and a boss, Spoiled Rotten. On completion, the next four areas of the game are revealed. This consists of four more Passages, each with four levels relating to a different theme with a boss at the end. The four Passages are the Emerald Passage, Ruby Passage, Topaz Passage and Sapphire Passage. These can be completed in any order. Once each bosses of these four Passages have been cleared, an inner pyramid, (the Golden Pyramid) is revealed on the main map. This includes one last level, (the Golden Passage) and the final boss; the Golden Diva. Unlike previous installments in the series, Wario is given a heart meter, which contains a total of eight hearts. Wario can collect hearts throughout the stages. Collecting one replenishes one heart of the meter. Wario loses a heart by touching a threatening part of an enemy, spikes, etc. He can also fully replenish his meter by opening a Heart Box. Below the heart meter is the heart gauge. Most enemies drop a little heart when defeated. Each little heart collected fills the gauge by an eighth. Filling it gives Wario an extra heart, and the gauge is then emptied. Each of the eighteen levels contains four Jewel Pieces, found within boxes, that need to be collected. When four Jewel Pieces in a level are joined, they form a Pyramid Jewel. The color of the Jewels varies on the Passage they are collected in. The player must collect all Jewel Pieces in a Passage to gain access to the boss. A Keyzer must be collected to unlock the next level. Without the Keyzer, the four Jewel Pieces in that level can still be collected, but the door to the next level remains locked. A Puzzle Room in Palm Tree Paradise. When Wario enters a level, he enters through a vortex, which closes behind him. The only way to open it again is to find the switch somewhere in the level. This reopens the vortex and allows Wario to return to the map screen. A time limit is given to return to the vortex. The player should focus on finding the four Jewel Pieces and the Keyzer before hitting the switch if possible. However, there are some areas that can only be accessed by hitting the switch. This is achieved through the Frog Blocks. The Frog Blocks can be found either solid or transparent. When the switch is hit, all transparent blocks become solid, while all solid blocks become transparent. This opens up new areas that can only be accessed when the switch is hit, so there may be some other Jewel Pieces or maybe even the Keyzer to find in that new area. As soon as the switch is hit, a timer appears on screen. The amount of time given to reach the vortex varies on the level and game mode. If the time runs out, the player's score quickly decreases and the level becomes black and white. When the score reaches zero, Wario is sent back to the main map and must start the level again. In the Golden Passage, the switch is placed at the beginning directly under the vortex, so Wario lands on it upon entering the last level. This makes the last level unique and more difficult in that he must recover all four Jewel Pieces and the Keyzer within a time limit. Legendary Treasure and Treasure Chests being restored to the Golden Pyramid. There are two Puzzle Rooms in each level (excluding the Entry Passage and Golden Passage). Each one is found in a Purple Pipe, and contains either a diamond worth 1000 points, or an amount of coins that are worth roughly 1000 points when combined. Wario must solve some sort of puzzle to obtain these points, usually using Arewo Shitain-hakase as an object to throw. Completing these rooms is optional and not necessary to complete the level or the game, but they provide an opportunity for the player to earn a few extra points. Likewise, the player never sees a Jewel Piece or a Keyzer in a Puzzle Room, but a Heart Box can be seen in some rooms. Wario about to exit a level through a vortex. There is also an additional bonus challenge to complete. In every level except for the Entry Passage and the Golden Pyramid, there is a hidden CD that can be collected and played in the Sound Room, each containing a different soundtrack. There is a total of sixteen CDs to collect. A Karaoke can also be unlocked, which is a full song with Japanese vocals. It can be unlocked by getting 10,000 or more points in each of the eighteen levels. The game records the player's best score (points collected) in each level. The amount of points obtained in a level affects what icon appears on the map screen when standing at the entrance of that level, next to the best score. A score of above 10,000 shows a Gold Crown, 8000 to 9990 shows a Silver crown, and a score of 6000 to 7990 shows a Bronze Crown. A score of below 6000 shows no crown. There is a total of twelve Treasure Chests in Wario Land 4. Each of the four main boss rooms contain three Treasure Chests, embedded into the wall in the background. Wario is not able to interact with them. During the boss battle when the time starts to run low (usually under a minute), the Treasure Chests in the background begin to disappear, one by one. Once Wario defeats the boss, the Treasure Chests that are left over are collected and stored in the Golden Pyramid for the final boss against the Golden Diva. The amount of Treasure Chests collected does not affect the main game. However, it does affect the game's completion, as the more Treasure Chests Wario obtains, the more beautiful Princess Shokora appears in the game's ending cutscene. Wario has several different moves in Wario Land 4. Mastering each one of them is essential for progressing in the game. Attack Wario can shift his body weight to ram into objects. He can hit the weak spot of enemies to destroy them, or break blocks to make a path. He also runs a tad faster than normal. Dash Attack Just like the regular Attack, but with more power. Wario must run for a short distance to build up momentum. Once he does, he runs at terrific speed and is able to break stronger, more solid blocks. Smash Attack A stronger version of the classic move that is mainly used in the Mario franchise can be used in Wario Land 4. Wario can use it to break blocks below, or defeat enemies. Super Smash Attack Similar to the normal Smash Attack but with more strength. Triggered by continuously ground pounding for a certain amount of time without hitting the ground. Wario can break the more solid blue blocks by performing this move. The move won't cancel until he hits the ground. Roll On a 45º degree slope in the floor, Wario can begin to roll. He can jump while moving, destroy blocks and defeat enemies by using this move. He stops rolling if he either hits something solid or falls into water. Swim Wario is able to swim when he is in a body of water. He can move forward, as well as upward and downward. However, he is unable to swim against water currents. Crawl When Wario has a small space to squeeze through, he can crawl to pass through. He can also jump while crawling. Throw If Wario picks up an enemy, rock or Pinball, he is able throw it upwards or sidewards. He can also break blocks from a long distance away. All of Wario's reactions in Wario Land 4 return from the last two games. Wario has a total of ten different reactions in the game, all having a different purpose to assist Wario in progressing through the level. This can include turning into a bat to reach a high place or catching fire to break certain blocks. All of the reactions have been based on previous games in the series, but they are put to more use in Wario Land 4. Wario is invincible to enemy attacks in all forms, and touching an enemy will either defeat it or simply knock it aside, depending on the reaction. Below is a table describing all of the reactions (exception: normal Wario). Wario Wario in his standard form. He can perform a ground-pound, ram enemies or blocks, crawl to get through thin spaces and throw small objects like enemies or rocks. Puffy Wario Wario after getting stung by a Beezley, or getting struck by the arrow of a Bow Balloon. His cheeks puff up in a supposed allergic reaction, and he is able to float continually upwards. When Wario hits a ceiling, he will turn back into his normal form. Flaming Wario Wario after catching fire from a Kaentsubo or Pig Head Statue. He runs without stopping while the fire spreads, but the player can still make Wario jump by pressing . He runs in the opposite direction when he hits a wall, and he will be engulfed in flames after hitting a wall three times. He is then able to destroy any Bonfire Blocks at this point. Touching water returns Wario to his normal form. Flat Wario Wario after being crushed by a Compressor. His body becomes very flat and lightweight, and he is able to get into small spaces. If he leaves the ground or jumps, he falls down slowly, swaying side to side, just like a feather. Wario can turn back into his normal form by entering a Decompressor or touching water. Fat Wario Wario, only fatter. He can turn into this form by eating apples thrown by a Ringosukī. Wario is invulnerable to enemy attacks, and enemies are killed by only touching them. Due to Wario's increased weight, he cannot jump high and walks slowly. Wario returns to normal after walking a certain distance or jumping a number of times. Bubble Wario Wario after touching an underwater bubble. He can float upwards until he reaches the surface. This allows him to bypass water currents, accessing areas that are otherwise inaccessible because the bubble is unaffected by these currents. Snowman Wario Wario after a mound of snow falls on him from a ceiling. Snow sticks to Wario around his belly area and he is greatly weighed down. If he touches a slope, Wario turns into a huge snowball and start rolling, breaking any Snowman Blocks that get in his way. Frozen Wario Wario after getting hit by a Yeti's sneeze. He becomes immobile and start sliding backwards. The ice breaks once Wario hits a wall or object. Bouncy Wario Wario when a Menhanmā strikes him with his hammer. He curls up into a spring and transform into Bouncy Wario. The player is able to make Wario bounce to incredible heights by pressing . If left alone, the bounce gains power. After jumping and hitting the ceiling, Wario transforms back into his normal form. He can also transform if he bounces too many times without using the high bounce. Zombie Wario Wario when a Skeleton Bird throws him goo. He moves slow, and jumping above a thin platform causes him to fall through the floor by pressing , reaching otherwise inaccessible places. Like Wario Land 3, he is still able to jump, but not as high as he would normally. Wario can transform back by either touching water or being exposed to bright light. Vampire Bat Wario Wario after touching a Minicula. In this form, Wario takes on the appearance of a bat, and is able to fly by repeatedly pressing , allowing him to reach high places. Unlike Wario Land 3, he cannot transform into an actual vampire. Returning to normal form can be achieved by touching water or being exposed to bright light, like with Zombie Wario. Prior to the boss room of each passage, there is a Mini-Game Shop where Wario can play one of three mini-games. If Wario receives a certain amount of points in each of the mini-games, he can earn medals which can be spent at the Item Shop for items to assist him in defeating the boss of that Passage. Three different colored Game Bots run the shop, each hosting a different mini-game. Each mini-game costs 5000 points to play (discounted to 2000 until Wario completes the Entry Passage). Blue Game Bot The Blue Game Bot runs the mini-game Wario's Homerun Derby. When selected, it brings out a pair of baseball bats and skillfully begins to juggle two baseballs up in the air. The symbol on the Bot's screen is the shape of a baseball pitch, similar to the one found in the mini-game. Red Game Bot The Red Game Bot is in charge of The Wario Hop. When the cursor selects this Bot, it immediately begins jumping up and down excitedly. Speakers appears on on its sides and white musical notes appear above the speakers. The symbol on the Bot's screen is also a musical note. The music theme reflects the funky tunes and sound effects heard in The Wario Hop. Yellow Game Bot The Yellow Game Bot owns the mini-game Wario's Roulette. When selected, the Bot's screen divides into three different colored sections. With the scrolling movement similar to a slot machine, the pictures change while showing a different set of eyes, noses, and mouths. The Item Shop in Wario Land 4 is a place where Wario can spend his medals in exchange for items. These items assist him in defeating a boss by dealing pre-damage at the start of a battle. The shopkeeper is a form of the Black Cat. This character is very similar to the later-occurring Mr. Game & Watch. However, a major difference between the two characters is that the Item Shopkeeper has eyes in Wario Land 4. A table of the nine items and their descriptions is shown below. Apple Bomb The Apple Bomb is an apple with colored stripes across the bottom half. It disguises a bomb that is concealed inside. When purchased, the Item Shopkeeper drags the apple to the boss room. She then raises the apple, which then breaks open to reveal a ticking bomb. She throws the bomb at the boss to inflict a small amount of damage. Blast Cannon The Blast Cannon is a gray cannon with multicolored stripes along the barrel. When purchased, it is wheeled to the boss room by the Item Shopkeeper. She then snaps her fingers, causing a bomb to be blasted as a projectile out of the cannon. It hits the boss to inflict a small amount of damage. Vizorman The Vizorman is a seemingly inanimate being that wears a vizor with a white suit with a cape. There is a letter "V" on its chest, with legs bearing multicolored stripes. The Item Shopkeeper drags the Vizorman to the boss room. She then starts charging a laser which is projected from the vizor and hits the boss, dealing a small amount of damage. Bugle The Bugle is a golden bugle with multicolored stripes across the lower half of the tube. It is carried to the boss room by the Item Shopkeeper. She then starts playing a tune on the Bugle, releasing many music notes which fly around the room, eventually hitting the boss and inflicting an average amount of damage. Black Dog The Black Dog is a dog with a huge jaw and bright yellow eyes. It is one of the four items where the Item Shopkeeper transforms into the actual item. When purchased, she follows Wario to the boss room, where she transforms into the Black Dog. The dog bites the boss several times, inflicting a large amount of damage. Large Lips The Large Lips is a being with oversized lips, which replace the whole head. The Item Shopkeeper follows Wario to the boss room. She then transforms into the Large Lips, which violently kisses the boss and deals a large amount of damage. Big Fist The Big Fist is a large fist that wears a white glove. It resembles Master Hand and Crazy Hand from the Super Smash Bros. series. The Item Shopkeeper transforms into the Big Fist which throws a powerful punch at the boss and deals a large amount of damage. Black Dragon The Black Dragon is a large dragon with a huge jaw and bright yellow eyes, with wings on its back that allows it to fly. When purchased, the Item Shopkeeper follows Wario to the boss room. There, she transforms into the fearsome Black Dragon, which breathes fire on the boss to deal a large amount of damage. Smile The Smile is the only item in the Item Shop that is free. However, it is a joke item. Selecting it only causes the Item Shopkeeper to smile and make a sound effect towards the player. This is a reference to the Japanese McDonald's menu which includes a "Smile" for free. Each item deals a fixed amount of damage to each boss. All damage totals are shown below. The last four items are not available for purchase against the first boss of the game, Spoiled Rotten. The Sound Room is a place found on the main map of the Golden Pyramid, where the player can listen to any CD that they have collected within the sixteen main passage levels. Each of the sixteen CDs have a unique track recorded on it. A bonus Karaoke can be unlocked by getting 10,000 or more points (a gold crown) in all eighteen levels. The Karaoke may also be temporarily unlocked by pressing Start, Select, Up, L and R together at the same time, while in the Sound Room. Many of the CDs features remixed audio which was originally elsewhere in the game, such as the switch sound effects in the So Sleepy CD. Selecting "Hard" mode upon creating a new save file. Note that "S-Hard" mode is not yet present as an option. The chosen game mode affects the location of the Jewel Pieces, the type and quantity of enemies, and the health the player begins with upon entering the level. For example, on S-Hard mode Wario enters the level with only one heart. The game mode also affects the time given to get back to the vortex after the player hits the switch (refer to the table in the section below). In a few levels on S-Hard mode, the switch even changes its location. Purchasing items from the Item Shop costs more medals on more difficult modes. The difficulty of Mini-Games are generally unchanged across difficulty levels. However, on S-Hard mode, Wario's Homerun Derby uses a cheerleader who throws very difficult pitches, compared to the lower level modes. After beating Hard or S-Hard mode, extra parts of the credits sequence are shown which feature Wario picking up women in his car. This table is a list of switch times given to complete levels in different game modes. It also includes the times to defeat the in-game bosses. Hall of Hieroglyphs The very first level in the game. It consists of a very simple layout, with hieroglyphs of the Item Shopkeeper on the walls that teach Wario his basic moves. Weak enemies such as Marumen and Spear-Masks appear in this level. In the Normal and Hard game modes, the switch is right at the end of the level (thus making it far easier to reach the vortex in time). However, in S-Hard mode, the switch is found near the beginning. Spoiled Rotten The boss of the Entry Passage is a purple, eggplant-like creature called Spoiled Rotten. It seems to be quite young, as it carries a blanket and toy doll. Accompanying it are two Eggplant Warriors that act as body guards. They behave exactly like Totsumen and they can be defeated in the same way. Spoiled Rotten is at first defenseless on its own, but after Wario rams it a few times, it will reach a point where its health is quite low. Spoiled Rotten will then throw a tantrum, bearing teeth that harm Wario on contact. He will then need to attack from behind. Defeating Spoiled Rotten will grant access to the four main Passages. Palm Tree Paradise The first level of the Emerald Passage is very straightforward and of extremely low difficulty. It takes place in a tropical setting with lots of palm trees. Marumen and Spear-Masks in low numbers patrol the grounds of this level. The level's path has no alternate routes for the player to take. In the Normal and Hard game modes, the switch is at the end of the level, and the player must go back the way they came to reach the vortex. However, the switch is placed right under the vortex in S-Hard mode (much like the Golden Passage), forcing Wario to complete the entire level within a time limit. The level's theme is a shortened version of the Karaoke soundtrack. Wildflower Fields The level Wildflower Fields takes place in a sunny field blossoming with wild flora. Throughout the stage, there are many Money Flowers that will swell and release coins after being pollinated by Beezleys. The Beezleys can also sting Wario and transform him into Puffy Wario, which will enable him to reach greater heights in the level. A lot of the level's structure is made up of giant sunflowers, which are hollow so Wario is able to pass through them. Mystic Lake The Mystic Lake is a location of great beauty, with lush grasses and cool lakes. A large part of the level is underwater, where Wario must swim most of the way. 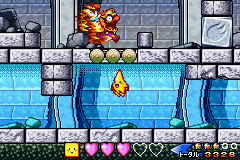 The waters are abundant in Goggley-Blades and Utsuboankō, which are enemies that harm Wario. In the mid-way point of the level, the Keyzer is guarded by Togenobi. After hitting the switch, the upper part of the level is unlocked, which mainly consists of blocks and falling spiky boulders. Monsoon Jungle The Monsoon Jungle takes place in a swampy setting with lots of water. The water is vastly infested with Tobawani, which will snap at Wario if he is found above them or if he swims nearby. Swinging platforms are in abundance above the water, which are used to allow Wario to safely cross without harm from the Tobawani. However, the swing is often difficult to time and the player may often find themselves falling in the water. After hitting the switch, Wario will gain access to the underground area of the level, where he will make his final progress before exiting. Cractus The boss of the Emerald Passage is Cractus, a possessed venus flytrap with a huge head that can skewer Wario with its claws and drool a poisonous liquid on him, turning Wario into Zombie Wario. Wario can deal damage by ground pounding its head. After taking a certain amount of damage, Cractus will stand upright which will make it harder for Wario to inflict damage on the creature. He will then have to climb one of the vines above the boss. Defeating Cractus restores the Crown to the Golden Pyramid. The Curious Factory The Curious Factory is a level full of machinery, such as conveyor belts, Compressors and Decompressors (which will transform Wario into Flat Wario and back again). Flat Wario can be used to enter tiny places. Togerobos make their unique appearance in this level, and Kaentsubos also make their first appearance here. Hitting the switch will open up the underground area of this level, which features an abundance of rotating platforms that Wario will have to cross. The Toxic Landfill The Toxic Landfill is a filthy, polluted level that is mainly made up of toxic water and garbage that takes the shape of blocks, which Wario must ram to destroy and make a path. Bow Balloons and Ringosukī are the main enemies that appear in this level. The arrows of the Bow Balloons will transform Wario into Puffy Wario, and the apples thrown by the Ringosukī will transform him into Fat Wario. Both reactions are crucial for progressing in the level. After hitting the switch, Wario must make his way through the underground part of the level to reach the vortex. 40 Below Fridge The level 40 Below Fridge, as the name suggests, takes place in a very cold fridge. The level is mainly made up of ice. Yetis are found in abundance in this level, which are snow creatures with a white coat. They have the ability to transform Wario into Frozen Wario by sneezing on him. Falling icicles from the ceiling damage Wario, while falling snow from the ceiling transforms him into Snowman Wario. If Wario walks on a 45° platform in this form, he will start rolling into a snowball and he will be able to break Snowman Blocks. Pinball Zone Pinball Zone is a funky, colorful and noisy level with many things going on at once. It takes place inside a pinball machine, where the main focus is throwing Pinballs into slots to break the Pinball Block, which will allow access to the next room. This is the only level to feature the Spike Cannons, which are undefeatable enemies that shoot spikes from their head. The level's background displays a different theme in every room, including forests, robots, dragons, and others. Cuckoo Condor The boss of the Ruby Passage is Cuckoo Condor, which is what appears to be a giant cuckoo clock. It can grab Wario and shoot gears and electricity at him. After taking a fair amount of damage, the cuckoo clock will fall apart, revealing a giant bird (presumably a condor) within. In this form, Cuckoo Condor can lay eggs that hatch into self-destructing chicks to damage Wario. Wario can counter this attack by catching and throwing the eggs at the Condor's head. Defeating Cuckoo Condor restores the Earrings to the Golden Pyramid. Toy Block Tower The first level of the Topaz Passage takes place in a toy castle, with lots of toy blocks found throughout the level. Several unique items appear in this level, including the Triangle Toy Block (which Wario must throw into the slot on a Toy Block Door to open the door) and the Rolling Toy Block (which Wario can ram to move along the ground and use as an object to stand on). Also unique to this level is the Pig Head Statue, which is a pig head that is fixed to a wall in the background. It spits out fire which flares up on the ground below, transforming Wario into Flaming Wario if he come into contact with it. The Big Board The Big Board is the only level to feature the chance wheel, which is an object with a rotating number counter that Wario can stop by hitting the blue button below the block. When it stops on a certain number, it will have numerous effects such as transforming Wario into many of his reactions, producing diamonds, or summoning Dice. The very last chance wheel will not disappear after the first hit, but will allow Wario to keep hitting it. This will eventually release the Keyzer. It contains many Toy Cars, being the main enemy found here. Doodle Woods The Doodle Woods is a level with a very up-beat feel to it. It is the only level to feature Hoggus, an untouchable enemy that loves to draw. It has a sketchbook, where it will produce drawings of Butatabis and Dendens which come to life and try to harm Wario. There are also many prominent features of the level related to drawing such as pencils and erasers that act as platforms or obstacles. Later in the level after the switch has been hit, Wario will come across an area where he must keep climbing upwards. There are several pictures of Deburīnas on the walls that may have been drawn by Hoggus, and some of them will come to life once Wario goes near them. Domino Row Domino Row is the only level in the game to feature the use of dominoes, which are found in increasingly long rows throughout the level. If Wario is to brush past a beginning of a row, they will begin to fall. At the end of the row is a switch. If the dominoes are to reach the switch first, a blue flag with a D will be raised. However, if Wario is to beat the dominoes to the switch and he hits it first, then a yellow and purple flag will be raised with a W on it. As a result, this will open up a path that would be more convenient for Wario to take, such as shortcuts or paths with more coins or Jewel Pieces. Aerodent The boss of the Topaz Passage is Aerodent, a rat that hides in a giant inflatable teddy bear. It throws down pin enemies, which Wario can throw to deflate the bear. This will allow Wario to ram the feet of the bear, flipping it upside down and exposing the rodent, its weak spot. Wario can then ram the rodent multiple times to inflict damage before it inflates the bear again. When Aerodent has taken a considerable amount of damage, the bear will drop flames that will transform Wario into Flaming Wario, causing him to run around the screen for a while and wasting valuable time. Defeating Aerodent restores the Necklace to the Golden Pyramid. Crescent Moon Village Crescent Moon Village takes place in a haunted, moonlit village. The first level of the Sapphire Passage introduces the many ghostly enemies that are native to the horror-themed levels, such as the Skeleton Bird and Men'ono. Most of the level takes a straight path, with many blocks and posts as obstacles. A notable enemy appearance in such areas is Yūrei, who, similar to Hoggus, appears in the level's background and cannot be touched. While Yūrei does not harm Wario, he tries to swoop down and grab any coins from defeated enemies or blocks before Wario does. However, Yūrei does not collect crystals or diamonds. Also, once Wario obtains the Keyzer, Yūrei will try and steal it. If he succeeds, Wario will have to chase him to retrieve it, thus wasting valuable time. Arabian Night Arabian Night is set in an abandoned Arabian village, with Indian-style buildings. Flying carpets are unique to this level, and they allow Wario to travel far distances. Mayu Birds are in abundance in the skies, where they will harm Wario if he touches their fangs. The level consists of indoor and outdoor areas that link to each other via building entrances. 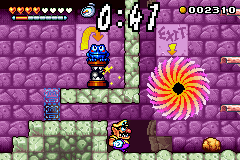 Wario is able to transform into Zombie Wario and Vampire Bat Wario in this level. After the switch is pressed, Wario must travel through an underground area that features flying carpets and a body of water filled with Goggley-Blades. Fiery Cavern Fiery Cavern takes place in an underground cavern with many pools of lava, some of which shoot lava upwards periodically. Touching the lava will damage Wario. An enemy that is unique to this level is Iwao, a primate that hurls giant boulders that damage Wario if he happens to be in its path. Wario can only defeat these creatures by performing a ground pound to their head. Wario will come across these creatures in great numbers throughout the first half of the level. In the second half when Wario hits the switch, everything in the level will freeze over, including the lava and the Iwao. As a result, Wario is now able to safely travel over the cooled lava, which is now solid ice. The Iwao, after being frozen in ice, quickly thaw and transform into Yetis. If they sneeze on Wario, he will transform into Frozen Wario. Hotel Horror This level takes place in an old, run down hotel that has four floors and many rooms (some of which are initially locked with a frog sign). Wario enters the level on the first floor, at room 101. Every room in the hotel is accessible, but not always straight through the front door. Most rooms consists of two floors, so the ones that do would have two entrances. To the far left of the hotel is a giant cage, where a Skeleton Bird hangs around the area. The main enemies in this level are Men'onos, which are ghostly creatures that populate the level's corridors and rooms. Miniculas and Skeleton Birds are also present, and they can transform Wario into Vampire Bat Wario and Zombie Wario, respectively. When the switch is hit, all doors locked with a frog sign on the front will be unlocked. Catbat The boss of the Sapphire Passage is Catbat. It is essentially a large, ghost-like cat with a statue of a bat on his head. Catbat has ears that act as bat wings, and likewise it is able to fly during the battle. There is a pool of water below the unstable flooring where a Mechanical Fish patrols by swimming back and forth. The drill on the Mechanical Fish's head will harm Wario if he touches it. Catbat creates waves which Wario must jump on top of, allowing him to ram the bat statue, which is Catbat's weak spot. After taking damage, Catbat will spit out purple spikes, which will turn Wario into Puffy Wario, wasting time. After taking enough damage, the bat will be destroyed, and Wario will have to ground pound the bald spot on top of Catbat's head. Catbat will also now spit out orange spikes that damage Wario. Defeating Catbat restores the Bracelets to the Golden Pyramid. Golden Passage The very last level is very different in terms of gameplay. For starters, the switch appears at the beginning of the level directly below the vortex, regardless of the game mode. This forces Wario to complete the whole level within a time limit. The whole underground area of this level consists of a river with a strong current that pulls Wario back towards the beginning of the level. In some of the overworld areas, there are places where Wario can fall, and he will land in the river and be brought back to a certain location due to the water's current. Most of the enemies that appear here are first seen in the Sapphire Passage. If the player is to use an Action Replay or some other similar hacking device, they can avoid hitting the switch and a hidden theme will play as the level's true theme, instead of the normal switch music. Golden Diva The game's final boss. She wears all four pieces of the Legendary Treasure collected from previous bosses. At the beginning of the battle, the Black Cat tries unsuccessfully to attack the Diva. The Golden Diva then swallows the feline whole and Wario is left to battle by himself. The Golden Diva has several different attacks, much more than previous bosses. She begins by hiding her face behind her fan, where four ghostly masks will try to pursue Wario. Wario will have to throw the masks at her fan to damage her. After the masks have been thrown, she will then cast several different enemies, one at a time, in an attempt to harm Wario. They are the Green Enemy (which Wario can throw), the Big Ball (which he must ram), the Black Duck (which he can also throw), and the Tonkachi‎ (which he must throw up in the air so it lands back on top of him, transforming him into Bouncy Wario, and allowing him to attack her mask). A few sequences of these enemies will bring the Golden Diva to a low point in her HP and destroy her mask. Her final phase will be unleashed, where her true face is revealed to be a fearsome size. She will start destroying the ground, revealing spikes that can damage Wario. Wario must ram the side of her head to damage her. When her HP is on the very last point, only her lips will remain. A simple attack to these lips will free the swallowed Black Cat. The ending cutscene then plays. Within the Golden Pyramid, there are a few characters who are willing to help Wario. They all have different purposes and their personalities and traits may differ, but they all have the same goal; to rid the Pyramid of the money crazed Golden Diva and to restore it to its former glory. Wario The game's protagonist and the only playable character in the game. Wario finds out about the Pyramid while reading a newspaper article. In the dead of night, he hops into his Wario Car and drives off across the desert and through a jungle to reach the Pyramid. He soon falls down a precipice and gets trapped inside. Black Cat While Wario is speeding through the city in his car, he almost runs over a Black Cat. A copy of the newspaper that Wario read about the Pyramid flies into her face. The Cat takes a curious interest in the article, and she decides to take a trip to the Pyramid herself. The cat seems to already know her way around the Pyramid, because she leads Wario to the main room. Keyzer Keyzers unlock the door to the next level in a Passage and disappear as soon as they do so. Eighteen Keyzers are found in the game, one for every level. Yūrei tries to steal Keyzer off Wario in the level Crescent Moon Village. Arewo Shitain-hakase Arewo Shitain-hakase is the detective that was exploring the Pyramid before Wario came and raided it. He also appears in the newspaper in the opening cutscene. While always minding his own business, Wario is polite enough to usually use him as an object to throw in a Puzzle Room. Item Shopkeeper The shopkeeper of the Item Shop is found in the corridor before the boss. She sells Wario items that assist in defeating the boss of that Passage. medals are used as currency, which are earned by achieving a good score in the Mini-Game Shop. The Item Shopkeeper is actually a form of the Black Cat, as she transforms in the final battle against the Golden Diva. Princess Shokora After the Golden Diva is defeated, Wario and the Black Cat escape the Pyramid before it crumbles on top of them. Outside, Wario and the cat laugh. However, the treasures that Wario stole from the Diva are suddenly absorbed by the Black Cat, and she undergoes a transformation and turns into Princess Shokora, the rightful ruler of the Pyramid. She kisses Wario to show her thanks, and gets lifted into heaven by four angels. Each of the six bosses guards a different Passage in the Pyramid. Items can be purchased with medals to weaken bosses at the battle's beginning. Defeating Spoiled Rotten unlocks the four main Passages, and clearing a main Passage boss stores its Legendary Treasure and collected Treasure Chests into the Golden Pyramid. Spoiled Rotten None The boss of the Entry Passage is a purple, eggplant-like creature called Spoiled Rotten. It seems quite young, as it carries a blanket and doll. Accompanying it are two Eggplant Warriors that act as body guards. They behave exactly like Totsumen and they can be defeated the same way. Spoiled Rotten is, at first, defenseless on its own. After Wario damages it a few times, however, it reaches a point where its health is quite low. Spoiled Rotten then throws a temper tantrum, bearing teeth that harm Wario on contact. Wario can damage it by attacking from behind. Defeating Spoiled Rotten grants access to the four main Passages. Cractus The boss of the Emerald Passage is Cractus, a possessed venus flytrap with a huge head and claws that can skewer Wario and drool a poisonous liquid, turning him into Zombie Wario. After taking a certain amount of damage, Cractus stands upright, making it more difficult for Wario to inflict damage on the creature. He then has to climb a vine above the plant. Defeating Cractus restores the Crown to the Golden Pyramid. Cuckoo Condor The boss of the Ruby Passage is Cuckoo Condor. It is what appears to be a giant cuckoo clock. He can grab Wario and shoot cogs and electricity at him. After taking a fair amount of damage, the cuckoo clock's structure falls apart, revealing a giant bird (presumably a condor), underneath. In this form, Cuckoo Condor can lay eggs that hatch into self-destructing chicks which Wario can counter by throwing the eggs back at the Condor's head. Defeating Cuckoo Condor restores the Earrings to the Golden Pyramid. Aerodent The boss of the Topaz Passage is Aerodent, a rat that hides in a giant inflatable teddy bear. It throws down pin enemies, which Wario can throw to counter-attack and deflate the teddy bear. This cause sit to flip upside down and expose the rodent, its weak spot. Once Aerodent has taken a considerable amount to damage, the Teddy drops flames. These flames not harm Wario, but instead turns him into Flaming Wario. He catches fire and run around the screen for a while, wasting valuable time. Defeating Aerodent restores the Necklace to the Golden Pyramid. Catbat The boss of the Sapphire Passage is Catbat. It is essentially a large, ghostly-like cat with a statue of a bat on his head, which is his weak spot. Catbat has ears that act as bat wings, and likewise he is able to fly during the battle. There is a pool of water below the unstable flooring where a Mechanical Fish patrols by swimming back and forth. The drill on the creature's head harms Wario if he is to make contact. Catbat creates waves which must be jumped over. In retaliation to any damage, Catbat spits out orange and purple spikes, which either damage Wario or turn him into Puffy Wario, respectively. The latter's purpose is to waste time. Defeating Catbat restores the Bracelets to the Golden Pyramid. Golden Diva All The game's final boss and the ruler of the Golden Pyramid. She wears all four pieces of the Legendary Treasure collected from previous bosses. At the beginning of the battle, the Black Cat is brave enough to confront the Diva, but she swallows the feline whole and Wario is left to battle by himself. The Golden Diva casts several different enemies into the battle, at one after the other but later on, several at once. Wario can counter attack these enemies to inflict damage on the Golden Diva. They are the Green Enemy, the Big Ball, the Black Duck and the Tonkachi. A few sequences of these enemies brings the Golden Diva to a low point in her HP. She then unleashes her final phase, where her head grows to a fearsome size and she starts destroying the ground. On the last point of health, nothing but her Lips remain. A simple attack to these Lips frees the swallowed Black Cat. The ending cutscene follows. During his adventure, Wario encounters more than three dozen kinds of enemies. While some can be found in more than one passage, many enemies are only unique to a certain passage. The enemy's characteristics usually go by the passage theme. Each enemy drops an assigned value of coins. The enemies that do drop coins will also drop a little heart when defeated. If both Wario's heart meter and heart gauge are full, then little hearts will be replaced by Silver Coins. The quantity and type of enemies is affected by the game mode, as harder difficulties will generally have more enemies, and easier enemies will be replaced by more difficult ones. An asterisk (*) next to the enemy name signifies that they transform Wario in some way. N/A under "Coins dropped" signifies that the enemy cannot be defeated. The following enemies may be found in multiple passages. This table is based on how enemies appear in Normal mode unless specified otherwise. No enemy appears in all six passages. 20 points A weak walking enemy which can be found in most passages. They are unable to hurt Wario in any way. Marumen change from purple to red and back again whenever Wario ground pounds near one. 10 points A common enemy wielding a spear as a weapon. They are found as yellow, blue, or red varieties, and change between these colors whenever Wario ground pounds nearby. The yellow Spear-Masks are slow moving, the blue Spear-Masks spin the spear they hold before they start to walk or when they change direction, and the red Spear-Masks charge at Wario whenever they catch sight of him. 50 points An aggressive creature wearing a mask with a knife attached to it. It charges at Wario at high speed when he comes near it. If its attack misses and it hits a wall or object, it flips over. They can then be safely rammed or ground pounded. Totsumen behave in a similar way to Eggplant Warriors. 100 points An enemy that is protected by a pink spiked shell. A ground pound causes it to flip over, exposing its vulnerable underside. 300 points A stronger version of a Harimen with a black shell. An S-ground pound or a jump by Fat Wario is required to flip it over. 10 points The most common aquatic enemy found in the game. It charges at Wario when it catches sight of him. Goggley-Blade's belly is its weak spot. Spiked Head None An immobile spiked creature that is seen more often in difficult game modes. They can be defeated if Wario throws another enemy or a rock at them. 10 points A spiked clam found in bodies of water. It quickly moves upwards when Wario comes near. Shieragucchi can be defeated with a hit from below. Ringosukī* None A monkey that throws apples which transform Wario into Fat Wario upon contact. Beezley* None A bee which flies down and stings Wario, causing his head to swell to a ridiculous size and transform him into Puffy Wario. They also pollinate Money Flowers. Bow Balloon* None An archer that shoots arrows at Wario, which have the same effect as a Beezley's sting. Menhanmā* None A hammer-wielding creature that tries to flatten Wario. Being hit turns him into Bouncy Wario. 50 points A snow creature that tries to freeze Wario with its icy sneeze, turning him into Frozen Wario. Kaentsubo* None A walking flame jar that tips over when Wario approaches, spreading flames which transform him into Flaming Wario on contact. Pig Head Statue* N/A A statue embedded into the walls that appears in the level Toy Block Tower, as well as some Puzzle Rooms. It drops flames out of its mouth, which transform Wario into Flaming Wario. Skeleton Bird* None A skeletal, ghost-like bird that drops green goo that turns Wario into Zombie Wario. He can then harm the Skeleton Bird by touching it in his zombie form. Minicula* N/A An invincible bat flying in circles that transforms Wario into Vampire Bat Wario upon contact. 50 points A hooded creature armed with an axe. It charges at Wario when it sees him and swings its weapon downwards. It can be defeated by a ram from behind or a ground pound, as long as Wario does not touch the axe's hitbox. Pearl Bird N/A A bird-like ally that is found in some Puzzle Rooms. It spits out glass orbs on regular intervals, and they smash when they hit the ground. Wario can catch and throw it at colored ! Switches to clear a path to a diamond. Eggplant Warrior None An eggplant-like creature wearing a headband with a knife. It assists the boss Spoiled Rotten. Eggplant Warriors act in the same way as Totsumen. 10 points A harmless, slow moving caterpillar. They mostly appear in Wildflower Fields. 50 points A mole-like creature wearing a mask with a drill that harms Wario. Some of them dig through the ground, and a ground pound will bring them out. Utsuboankō N/A A giant sea monster that hides in a hole in the background. They emerge quickly when Wario comes near, damaging him on contact. Togenobi N/A A large octopus with four rotating tentacles that hold maces. 10 points A crocodile enemy that swims near the water's surface. They jump up and try to bite Wario once he is above them, and chase Wario if he is in their waters. Hotaru* N/A An enemy that accompanies the boss Cractus. If Wario touches the toxic drool of Cractus, he transforms into Zombie Wario, rendering him unable to attack the boss. Afterwards, Hotaru appears on the screen, and touching him reverses the effects. 200 points A heavy robot with spikes on its back. They have a spiked head that they can drop when they catch sight of Wario. The head rolls along the ground, damaging Wario if it hits him. Togerobo grows back a new head if the other one is gone after a short time. A ram from behind or a ground pound (before the spiked head grows back) defeats it. 50 points A bottle walking on four legs. It is armed with a spear on its front, which retracts if it is disturbed. It can be defeated by a ground pound or a ram from behind. Robo Bird None A robotic bird that attacks by flying in a straight line as soon as soon as it spots Wario. It inflicts damage if it makes contact with Wario. It only appears in the Hard and S-Hard game modes. It can be defeated by a standard ground pound or ram. Spike Cannon N/A An enemy that only appears in the level Pinball Zone, mostly around wire mesh that Wario must climb. They shoot out spikes from the top of their heads at regular intervals, harming Wario if they make contact. The top of its head acts as a platform, where Wario can stand. However, he can only do this while no spikes are being released. Hiyoko None An enemy that is produced by the condor form of the boss Cuckoo Condor. The boss lays eggs which hatch Hiyoko as soon as they hit the ground. They start to flash bright orange before blowing up, harming Wario if he is nearby. Wario can catch the eggs before they break and throw them as a projectile. 10 points A tiny Wario driving a mini Wario Car with a spike on the front. They slowly drive along the ground, harming Wario if the spike touches him. Dice None A walking dice wielding a spear. They emerge from a chance wheel when the appropriate space on the ribbon is struck. Hoggus N/A A floating pig-like artist that does not harm Wario directly. He draws Dendens and Butatabis, which come to life shortly after he draws them. Denden None A pig in a spiked shell created by Hoggus. It rolls along the ground when Wario comes near (similar to a Togerobo's head). Butatabi None A pig with a spike on its head created by Hoggus. It glides from right to left. 50 points A drawing of a dancing pig that has come to life. Deburīna has a hula hoop around its body that rotates while it dances. The edge of the hoop harms Wario. Pin enemy* None A hopping creature with a spike on the bottom assisting the boss Aerodent. They have to be thrown by Wario at the bear balloon to defeat the boss. Yūrei N/A A pirate-like ghost that does not harm Wario, but follows him and tries to pick every coin before Wario can do so. He also tries to steal the Keyzer off Wario. He cannot be touched by Wario and likewise, he cannot be defeated. Mayu Bird None A bat-like creature that only flies within a small area, but can be found in large groups. They have fangs on their underside which harm Wario. They can be defeated by a ground pound or a ram. If they are tapped on the side, they will fly away, but will not be defeated. 50 points A mummified enemy wielding an axe. It uses the same attack as Men'onos, and can be defeated in the same way. 100 points A burly creature that throws rolling rocks at Wario. They turn into Yetis when the switch is hit in the level Fiery Cavern. It can only be defeated with a ground pound on the head. Mechanical Fish None A mechanical fish with a drill patrolling the pool of the boss Catbat. An S-ground pound is the only way to defeat it. Toge* None An enemy that accompanies the boss Catbat. Whenever Catbat takes damage, he coughs out small spiked balls as projectiles which float in the air. If Wario touches the purple ones, he transforms into Puffy Wario. After Catbat's HP gets down to a certain point, he will cough out red Toges, which harm Wario. The last part of the game does not introduce new enemies, aside from the creatures created by the Golden Diva. Some enemies that are otherwise exclusive to the Sapphire Passage reappear in the Golden Passage, the last level before the final boss. This includes Skeleton Birds, Men'onos, and Miniculas. Green Enemy N/A A creature produced by the Golden Diva. It flies down from the sky, moving from side to side. When it hits the ground, or if Wario stuns it, Wario can pick it up and throw it at the Diva to inflict damage. Big Ball None The Big Ball is dropped by the Golden Diva. It is a blue ball with a bear that looks like Aerodent on it. Wario can ram it to send it flying, bouncing off the walls and possibly hitting the Diva, causing her damage. The ball explodes by itself if left alone. Black Duck None The Golden Diva can throw black eggs at Wario, which crack open on impact on the ground to reveal a time-bombed duck. They walk back and forth across the stage, flashing faster and faster, until they explode. Wario can catch the eggs before they hit the ground, and then throw it at the Golden Diva to inflict damage. Tonkachi* N/A A spiky hammer which is thrown by the Golden Diva. Shortly after hitting the ground, it loses its spikes. Wario can then throw it up in the air with the intention of it landing on him, transforming him into Bouncy Wario. He can then use this reaction to damage the Diva. Diva's Lips None When the Golden Diva has been defeated, her lips remains wiggling helpless across the stage. Wario must merely ground pound or ram once to destroy them. Once he does, the Black Cat is freed (since the Diva swallowed her) and the ending cutscene plays. The game received generally positive reviews. The "portable masterpiece" received praise and excellent review scores on its soundtrack, collectibles throughout the game and its general thrill of satisfaction. One gaming website commented about even on its ten year anniversary, it "still remains the best portable Mario game to date". IGN gave Wario Land 4 a nine out of ten, or "Outstanding", citing its well thought out level design and replayability, and how the game "puts a lot more emphasis on action" compared to its predecessors. Praise was also given to how much attention the developers paid to the sounds and music. It was not given a full ten because the game does not necessarily push the performance power of the Game Boy Advance in regards to animation design. The website quoted that "it's a little disappointing to see that Wario isn't much of a step beyond his GBC adventure in terms of art and animation...other than the sprite effects, it could have been done on the 8-bit handheld". Game Boy Advance Jason D'Aprile, Gamespy 88/100 "Definitely the GBA side-scroller that Nintendo fans were waiting for, Warioland 4 is an incredibly entertaining, diverse, and humorous addition to the Mario/Wario legacy. It's challenging and creative, but not as outright frustrating as Warioland 3. Fans disappointed by Mario Advance will especially appreciate this gem." Game Boy Advance Shane Satterfield, GameSpot 8.7/10 "If you're looking for a quality 2D platformer for your Game Boy Advance, look no further than Wario Land 4. As Nintendo's first platforming game developed solely for the GBA, it shines in all the right places. The gameplay is tight and varied, the graphics are detailed and bright, and the sound is second to none. Wario Land 4 does have some confusing puzzles in its later stages that may be too difficult for younger players, but for everyone else, it comes highly recommended." Game Boy Advance Craig Harris, IGN 9/10 "Wario rocks -- there's a lot of variety in the game design and is more challenging than the usual side-scrolling fare due to its focus on making players figure out how to get to certain locations in the level. It's slightly similar to Klonoa in that respect, but Wario Land 4 puts a lot more emphasis on action. The slight control glitch at ladders is a bit of a drag, and the mini-games are more silly than they are fun to play. Wario Land 4 is also the first Nintendo GBA product without any link support...but I'm willing to look the other way on this fact since the single player adventure is so good." For a complete list of media for this subject, see List of Wario Land 4 media. Flaming Wario in Densetsu no Stafy 3. Wario makes a guest appearance in Densetsu no Stafy 3, where Wario helps Starfy throughout the Undersea Ruins by using some of his reactions from Wario Land 4. Wario and Starfy arrive at a vortex, where they must enter to locate the switch and four Jewel Pieces in order to unlock the boss's door. Wario can transform into Bubble Wario, Flaming Wario and Puffy Wario respectively. Metroid Fusion's unused game data shows various assets from Wario Land 4, including large blocks and crystals, which suggests that the game was based on the same engine as Wario Land 4. Wario's voice clips in Wario Land 4 were later reused for the WarioWare games. Additionally, the music and other sound effects in this game were also reused in WarioWare, Inc.: Mega Microgame$!. The Wii game WarioWare: D.I.Y. Showcase features a Microgame titled "Wario Land", which features sprites and concepts taken from Wario Land 4. In the microgame, Wario must use dash to break through a block and defeat a yellow Spear-Mask. The attack must be timed to successfully strike the Spear-Mask while its spear is facing away from Wario. The theme of the Item Shop is used as Mona's theme melody. The music can also be heard in WarioWare, Inc.: Mega Microgame$! in a less modified form when the Gelateria is seen from the inside during Mona's story. The song that plays whenever a character's story is cleared and all the other employees are shown at the Gelateria is a shortened version of "Mr. Ether & Planaria". A slightly sped up version of Palm Tree Paradise's theme can also be heard in the microgame Balancing Act. The whispering heard in the Sound Room's "The Short Futon" was used for the microgame Right in the Eye. One of the songs available for Jump Forever is the theme for Pinball Zone. Additionally, part of Crescent Moon Village's theme can be heard during the epilogue of Wario's second set of microgames in Mega Microgame$!. For this subject's image gallery, see Gallery:Wario Land 4. Wario Land 4 was first announced at E3 2001. The first released screenshots were very different from the final game. Wario had a darker, more orange skin tone. A lot of the enemies were also shown to have a different color scheme. A notable difference from the final game is how Wario originally had a Garlic meter, serving as a replacement for the heart gauge below the heart meter. The Mini-Game Shop was going to be called the Game Corner, and Wario originally needed a Key to unlock a Jewel Piece Box. The credits screen in Wario Land 4 shows Wario driving his Wario Car back home through the desert after stealing the treasure from the Golden Pyramid. Nintendo R&D1 developed Wario Land 4, with the executive producer being Hiroshi Yamauchi. Hirofumi Matsuoka (who had previously co-directed Virtual Boy Wario Land) directed the game. The game was among the first Nintendo projects for Goro Abe and Ko Takeuchi, who later become key figures of the WarioWare series. Wario Land 4 is the last active development credit of Wario's creator, Hiroji Kiyotake. Following the release of the game, Kiyotake assumed a supervisor role inside Nintendo SPD. There are currently three known glitches in Wario Land 4. The player is able to fly vertically, hold an invisible object and walk through walls. All of these can be encountered during normal gameplay. In Wario Land 4, there is not a large amount of quotes within the game itself. But there are many notable quotes within the game's instruction manual, where Wario describes to the reader many aspects of gameplay and a few enemy descriptions. Some of the most notable are shown below. "Legendary Pyramid discovered deep in Jungle!! Legendary Treasure nearly found, but accidents hindered findings." – Newspaper article seen in the game's opening cutscene. "Rumour has it that no one who’s entered the Golden Passage have ever come out alive! Scary! "– Wario warning the player of the dangers found in the Golden Passage. Part of the vocals used in the game's title track were taken from the first track of Zero-G's Vocal XTC audio sample compilation. The specific vocal lines in question are "Your time is over, I've had enough! Here I come! Look out, here I come! ", sung by British session singer Helen Binding. This page was last edited on April 23, 2019, at 16:54.